Western Canada, also referred to as the Western provinces and more commonly known as the West, is a region of Canada that includes the four provinces of Alberta, British Columbia, Manitoba and Saskatchewan. British Columbia is culturally, economically, geographically, and politically distinct from the other parts of Western Canada and is often referred to as the "west coast" or "Pacific Canada", while Alberta, Saskatchewan, and Manitoba are grouped together as the Prairie Provinces and most commonly known as "The Prairies". The capital cities of the four western provinces, from west to east, are; Victoria (British Columbia), Edmonton (Alberta), Regina (Saskatchewan) and Winnipeg (Manitoba). With the exception of Winnipeg, which is the largest city in Manitoba, all other provincial capitals of the Western Provinces are located in the second-largest metropolitan areas of their respective province. Manitoba established as a province of Canada in 1870, following the enacting of the Manitoba Act. British Columbia: Under terms that Canada would absorb the colony's debt, would begin to subsidize public work, and would begin to construct a railway allowing travel from British Columbia to Ontario, British Columbia agreed to join Canadian confederation in 1871. Saskatchewan: Established as province in 1905, with the implementation of the Saskatchewan Act. Alberta: In 1905, the same year as Saskatchewan, Alberta also was established as province. Just like Saskatchewan had the Saskatchewan Act, Alberta had the Alberta Act. As of the 2016 Census, the total population of Western Canada was nearly 11.1 million, including approximately 4.65 million in British Columbia, 4.07 million in Alberta, 1.1 million in Saskatchewan, and 1.28 million in Manitoba. This represents 31.5% of Canada's population. While Vancouver serves as the largest metropolitan area in Western Canada at nearly 2.5 million people, Calgary serves as the largest municipality at over 1.2 million people. Vancouver is the largest census metropolitan area by population in western Canada. As of the 2016 Census, Statistics Canada recognized ten census metropolitan areas within Western Canada, including four in British Columbia, three in Alberta, two in Saskatchewan, and one in Manitoba. The following is a list of these areas and their populations as of 2016. Western Canada consists of the country's four westernmost provinces: British Columbia, Alberta, Saskatchewan and Manitoba. It covers 2.9 million square kilometres – almost 29% of Canada's land area. British Columbia adjoins the Pacific Ocean to the west, while Manitoba has a coastline on Hudson Bay in its northeast of the province. Both Alberta and Saskatchewan are landlocked between British Columbia and Manitoba. The Canadian Prairies are part of a vast sedimentary plain covering much of Alberta, southern Saskatchewan, and southwestern Manitoba. The prairies form a significant portion of the land area of Western Canada. The plains generally describes the expanses of largely flat, arable agricultural land which sustain extensive grain farming operations in the southern part of the provinces. Despite this, some areas such as the Cypress Hills and Alberta Badlands are quite hilly and the prairie provinces contain large areas of forest such as the Mid-Continental Canadian forests. In Alberta and British Columbia, the Canadian Cordillera is bounded by the Rocky Mountains to the east and the Pacific Ocean to the west. The Canadian Rockies are part of a major continental divide that extends north and south through western North America and western South America. The continental divide also defines much of the border between Alberta and British Columbia. The Columbia and the Fraser Rivers have their headwaters in the Canadian Rockies and are the second- and third-largest rivers, respectively, to drain to the west coast of North America. To the west of their headwaters, across the Rocky Mountain Trench, is a second belt of mountains, the Columbia Mountains, comprising the Selkirk, Purcell, Monashee and Cariboo Mountains sub-ranges. The coast of British Columbia enjoys a moderate oceanic climate because of the influence of the Pacific Ocean, with temperatures similar to those of the British Isles (though Vancouver receives more precipitation than London and most of the Coast is much wetter). [citation needed] Winters are typically wet and summers relatively dry. These areas enjoy the mildest winter weather in all of Canada, as temperatures rarely fall much below the freezing mark. The mountainous Interior of the province is drier and has colder winters, but experiences hotter summers than the more moderate coastal areas. Lytton, British Columbia, a small town that sits at the confluence of the Thompson River and Fraser River recorded the second-hottest temperature in Canada at 44.4 °C (111.9 °F) observed on July 16 and 17 1941, and is regularly referred as Canada's hot spot in summer with temperatures easily reaching the mid to high 30 °C 's (upper 90s to low 100s °F) in July and August and sometimes top 40 °C (104 °F). Alberta has a dry continental climate with warm summers and cold winters. The province is open to cold Arctic weather systems from the north, which often produce extremely cold conditions in winter. Winters are generally quite cold, though some areas can experience a phenomenon known as the "Chinook wind," wherein warm winds raise the winter temperatures temporarily. In contrast, summers can fluctuate from cool to hot and are generally wetter. Saskatchewan and Manitoba have a continental climate and experience extremes in weather. Winters in both provinces can be classified as harsh with Arctic winds and −40 °C (−40 °F) temperatures possible. Winter temperatures in both provinces average between −10 and −15 °C (14 and 5 °F). In contrast, summers can be hot with temperatures exceeding 35 °C (95 °F) at least once per year in most locations. The hottest temperature ever recorded in Canada was 45 °C (113 °F), observed in 1937 at the weather stations of Yellow Grass, Saskatchewan and neighbouring Midale. 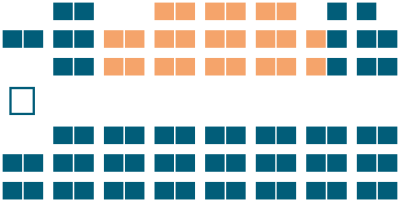 In Canadian politics, the term "the West" is used misleadingly in Canadian media style guides as shorthand for the Conservative leanings of Western Canadians, as contrasted with the greater likelihood for candidates from either the Liberal Party of Canada or the New Democratic Party (NDP) to be elected in Central Canada[citation needed]. Exceptions exist, particularly in British Columbia, as well as in the prairie city of Winnipeg, and where the Liberal Party hold seats, as well as in other major urban centres such as Edmonton where Liberal and NDP candidates have been elected in recent history. The social democratic NDP had its origins on the Canadian Prairies and in the mining and pulp mill towns and railway camps of British Columbia, and has a history of support in Manitoba, and British Columbia. The western provinces are represented in the Parliament of Canada by 104 Members of Parliament (MPs) in the House of Commons (British Columbia 42, Alberta 34, Saskatchewan and Manitoba 14 each) and 24 senators (6 from each province). Currently, of the 104 western MPs in the Commons, 54 are Conservatives, 20 are New Democrats, and 29 are Liberals. Regarding provincial politics, from June 2015 to June 2017, the British Columbia Liberal Party formed the provincial government in British Columbia, though despite the name is not formally allied with the federal Liberal Party and is widely seen as conservative in nature and is composed of elements from the federal Conservative Party's right wing, including many ex-Reform Party supporters. 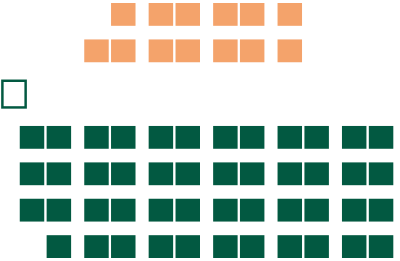 Following the 2017 provincial election in British Columbia, the British Columbia New Democratic Party formed a minority government with the support of the British Columbia Green Party, following the defeat of Christy Clark's BC Liberal Party government by a confidence vote in the legislature. The Saskatchewan Party, also a conservative party, holds power in Saskatchewan and the NDP forms the government in Alberta. The West has been the most vocal in calls for reform of the Senate, in which Ontario, Quebec, and particularly Atlantic Canada are seen by some westerners as being over-represented. The population of Ontario alone (13.1 million) exceeds that of all the Western provinces combined. The total population of Atlantic Canada, however, is 2.3 million, and this region is represented by 30 senators. Thus, Ontario is under-represented, Quebec has representation proportional to its population and the Atlantic provinces are over-represented. Westerners have advocated the so-called Triple-E Senate, which stands for "equal, elected, effective." They feel if all 10 provinces were allotted an equal number of senators, if those senators were elected instead of appointed, and if the Senate were a body that had more direct political power (for example via an arrangement more similar to the structure of the Australian Senate or the United States Senate rather than the UK model), then their region would have more of its concerns addressed at the federal level. Other westerners find this approach simplistic and either advocate keeping the status quo or may support other models for senate reform. The combination of all of these issues has led to the concept known as Western alienation, as well as calls for Western Canada independence by various fringe groups. ^ "Population and dwelling counts, for Canada, provinces and territories, 2011 and 2006 censuses". Statistics Canada. 2012-01-24. Retrieved 2012-03-17. ^ a b "Census Profile, for Canada, provinces and territories, 2016 censuses". Statistics Canada. 2017-02-08. Retrieved 2012-02-11. ^ a b "The Canadian Population in 2011: Population Counts and Growth" (PDF) (PDF). Statistics Canada. February 2012. ISBN 978-1-100-19962-7. Retrieved December 27, 2014. ^ a b c d Adam Dodek (2013). The Canadian Constitution. Dundurn. p. 19. ISBN 978-1-4597-0932-4. ^ Kennedy, W.P.M. "Statutes, treaties and documents of the Canadian Constitution, 1713- 1929". Early Canadiana Online. Oxford University Press. Retrieved 10 February 2015. ^ "British Columbia". Canada in the Making: Constitutional History. Early Canadiana Online. Archived from the original on 16 May 2015. Retrieved 10 February 2015. ^ "1867-1931: Canada in the Making". Canada in the Making: Constitutional History. Early Canadiana Online. Archived from the original on 16 May 2015. Retrieved 10 February 2015. ^ "Population and dwelling counts, for census metropolitan areas, 2016 and 2011 censuses". Statistics Canada. February 2018. Retrieved 2018-06-05. ^ "Population and dwelling counts, for Canada, provinces and territories, and census subdivisions (municipalities), 2016 and 2011 censuses – 100% data". Statistics Canada. February 2018. Retrieved 2018-06-05. ^ "Population and dwelling counts, for Canada and census subdivisions (municipalities), 2016 and 2011 censuses". Statistics Canada. February 2018. Retrieved 2018-06-05. ^ "Calgary International Airport". Canadian Climate Normals 1981–2010. Environment Canada. Retrieved May 8, 2014. ^ "Edmonton City Centre Airport". Canadian Climate Normals 1981−2010. Environment Canada. August 19, 2013. Retrieved September 10, 2013.